The product is not available for shipping from our warehouse. We will special order this from the manufacturer once your order is placed and the order cannot be cancelled nor returned once the item is allocated. When the product arrives in our warehouse, it will be sent to you within 24 hours of receipt. Est. arrival is 2-4 weeks (subject to availability). You will be contacted via email with a status on the item within 3 Business Days. A confirmation e-mail will be forwarded to you within 24 hours of the product being sent. Total Capacity: 22.6 cu. ft.
Freezer Capacity: 6.9 cu. ft. 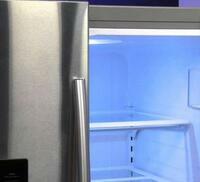 Adjust the refrigerator and freezer temperatures independently. Choose from 9 preset selections (like Ready to Serve, Cheese, White/Sparkling Wine, Beer, Fish/Shellfish) plus three customizable settings to ensure your food remains at the ideal temperature for serving and maintaining freshness. All-glass shelves can be arranged in a variety of flexible configurations to fit wide and tall items. 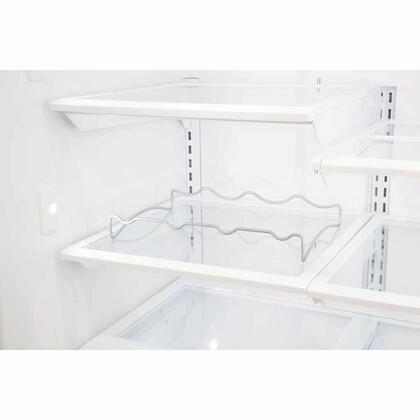 Stay well organized with our tri-level freezer organization system. Three large-capacity baskets feature removable dividers and smooth-glide roll out. And, baskets at the top are removable, allowing you to configure the space as needed to neatly fit large or small items. Our pure filtration system circulates clean, filtered air throughout the interior to prevent odor transfer. Plus, fresh ice is easy-to-access. Soft, transitional LED lighting gradually illuminates the interior with ample light as you open the door. Perfect for night time trips to the refrigerator! 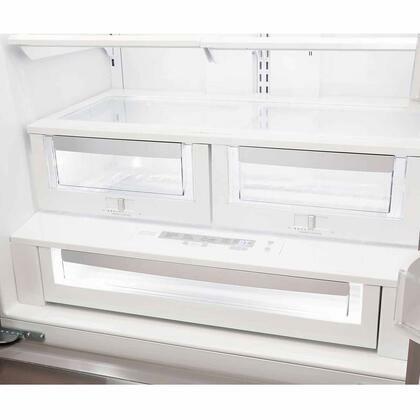 Smooth-glide crisper drawers feature adjustable humidity control and minimal temperature variation to preserve even the most delicate fruits and vegetables longer. 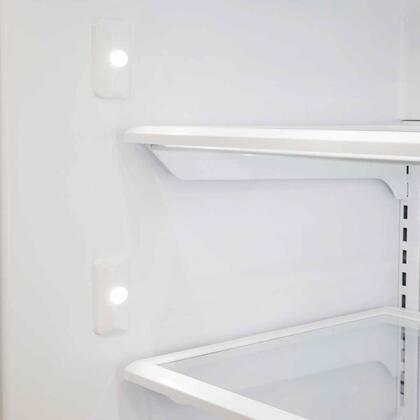 To protect the temperature integrity of your refrigerator contents, you’ll be notified of any power failures, if a door is ajar over five minutes, and if the interior cabinet temperature rises above 56 degrees for more than 20 minutes. 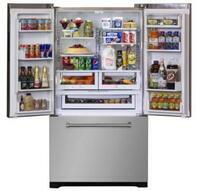 Fresh Food Volume: 15.4 Cu.Ft. 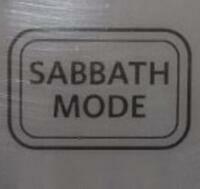 Is Star-K certified for Shabbat-observing households. To protect the temperature integrity of your refrigerator contents, you`ll be notified of any power failures, if a door is ajar over five minutes, and if the interior cabinet temperature rises above 56 degrees for more than 20 minutes. Marvel`s pure filtration system circulates clean, filtered air throughout the interior to prevent odor transfer. 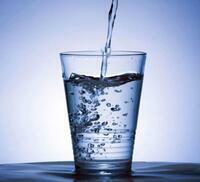 Plus, water is filtered for perfectly fresh ice. 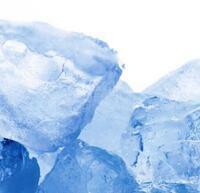 The automatic ice maker supplies reliable production and storage of ice cubes that always taste fresh. 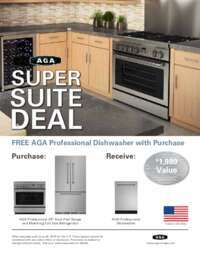 Buy any eligible AGA Range with a matching full size Refrigerator and get a FREE AGA Dishwasher* valued up to $1989. Depth with Door at 90 Degrees: 42.5625"
Depth with Drawer Fully Extended: 44.5"
I never knew what I was dealing with until I received my new refrigerator. Man! I'm not sure why I kept using my old Samsung refrigerator for so long. Had to replace my daughter’s old refrigerator after only a few years of use. Found a great deal on this AGA fridge on AppliancesConnection.com and she is very satisfied with it. Our neighborhood just introduced a monthly farmers' market and I love stocking up on fresh produce. The large temp-controlled vegetable bins are perfect for this. Everything stays crisp and unspoiled until the next market day. 18 months later and I'm happy with every facet of this refrigerator. I owe most of it to AppliancesConnection.com for steering me in the right direction. I do not understand the other negative reviews on this refrigerator. If I'd only taken them into account, I certainly would've run away from this fridge. I did, though, make my decision to purchase this AGA based on thorough research from independent consumer journals that all sang its praises. I'm glad I chose to believe them because this fridge is brilliant. While browsing various website to find the right refrigerator, I came across appliances connection and saw how great their review is and I really wanted to give them a try. Because, last time when I ordered appliances online, it was such a disaster and not the best experience. Thus, at first I was bit iffy when I had the thought of buying it online. However, after seeing all the reviews I just wanted to give them a try and decided to purchase it. 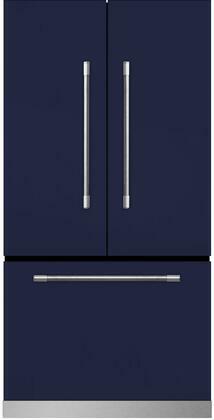 We’ve had this French Door AGA refrigerator for about 5 months now and we love it! Guests often compliment it and how much it can hold. Very happy! Love the style of this fridge. Easy to Clean, Easy to Use, High Quality, Easy to Install, Looks Great, Nice Design.